The final installment in our little advent calendar of my favorite things of the year concludes with my favorite game this year. There were many great games this year, but there was one that managed to appeal to me on just about every level. Gameplay and story perfectly blended to create a compelling experience. It also had robot dinosaurs ... robot dinosaurs ... they were going to have a hard time not being my game of the year. Thankfully Horizon: Zero Dawn was so much more than the robot dinosaurs. Horizon was so much more than what you might expect from yet another open world game. The sub genre has started to tire for many gamers, myself included, with few surprises and more map pointers to chase than you have time to, or care to. So I was worried that they might ruin their new shiny original IP. Thankfully the folks at Guerrilla have navigated the challenges superbly. Firstly, the story is brilliant. It's well written. It has a wonderful protagonist, and the supporting characters are interesting. Likewise the pacing is exceptional. Honestly, it's more like three separate stories that weave together brilliantly. The first sees you get to know the central character, Aloy, as she goes through a pretty well executed 'rite of passage' story. You learn she has been an outcast from her tribe, and while the seeds to key parts of the games mystery are sown in this section, the story deftly chooses to not get bogged down in 'save the world' stuff immediately. Instead it gives Aloy, and her tribe, and their traditions time to breath. So by the times you hit the end of that first arc, you feel a sense of what is going to be at stake in the rest of the game, and suddenly all of the players have motivations you have some context for. It is subtle, but very well executed. Then the game opens up and you discover the world, while trying to piece together the wider political landscape of this world. You discover this world as the character does, which is again, a subtle design choice, but a very powerful one. Then the final arc pushes you through with some wonderful revelations. 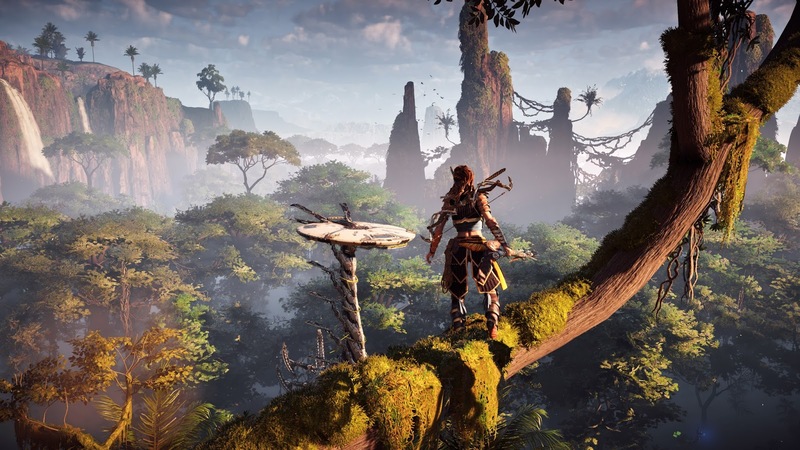 It layers its major story points so that it genuinely feels like it is opening up a chapter at a time, and Aloy's progress from strong willed explorer, to champion and leader, feels natural. Then there is the game-play. The core loop of doing battle with the robotic dinosaurs of this weird post apocalyptic world is also very well executed. It's fun, it encourages experimentation, and by and large handles the escalation of threat well. There is a slight drop off towards the end of the last arc as Aloy does become a very powerful warrior. It didn't really detract from the overall feel though. For the first twenty to twenty five hours of the game it genuinely retains a level of challenge appropriate for the difficulty you are playing on. By the time Aloy becomes a little overpowered, and she does, it comes as the final arc is hurtling towards it's conclusion and almost feels appropriate. For me, it left the final few encounters feeling a little anti-climatic game-play wise, but the spectacle, and story pay-off compensated ably. So great story, great characters, and compelling gameplay. Sounds good right? It is also a gorgeous game. The art, character design, and in particular the level design manage to reach levels of polish that are impressive throughout. It might even be my favorite part of the game, and that is high praise. The level design is exceptional. It is a huge part of why this works as an open world game. You simply want to explore this world. The level design encourages that desire at every turn. All these things combine to successfully build a new world, and immerses you in it. If you are reading here you probably know what I feel about developing original new stories. I hope the success of this game prompts others to push to create their own new gaming worlds. So even if you have already dedicated hundreds of hours to whatever else you played this month, don't miss this one. It is worth the visit. My game of the year in a year that had quite a few great games.